In July 1935, God used a woman named Mrs. Montgomery to reach out to her neighbors in San Antonio, Texas. For months, this persistent woman had asked her neighbor, Mrs. Martinez, for permission to take her kids to church. Finally, after more than two-dozen visits, Mrs. Martinez agreed to let her children accompany Mrs. Montgomery to church. When Mrs. Montgomery stopped by to pick up the kids on Sunday afternoon, Angel, the oldest of the kids, did not want to go. However, when he learned that those who attended the summer bible school would receive free ice cream and a bag of cookies, Angel decided to go. He said that in those Depression years, his family could not afford ice cream and he really wanted some ice cream. Angel attended the bible school but got much more than ice cream. For the first time in his life he heard a clear presentation of the gospel and decided to return the following day. On July 8, Angel arrived at the church a little late because he had been shining shoes on the sidewalks of San Antonio. He arrived in his bare feet and holding his shoe-shine box. Angel listened attentively to the story of Jesus and Nicodemus that afternoon and placed his faith in Christ for salvation. The rest is history. In September of that year, Angel preached his first sermon and began his journey into vocational ministry. In the course of his 60-year preaching ministry, an estimated 500,000 people came to faith in Christ. Angel also memorized the entire New Testament and could quote chapter and verse without hesitation. He was a brilliant man and a powerful orator. Who would have thought that the 13-year old shoe-shine boy from San Antonio, Texas had within him this kind of potential. And what might have happened if Mrs. Montgomery had not been so persistent or if the church had not had enough volunteers to work with children that summer? Angel’s story reminds me that we should never underestimate what God can do with small beginnings. And, his story teaches that each of us can play a significant role in the work of God’s kingdom. We must, however, be willing to lay aside comforts, ignore distractions, and engage in the kind of work that will outlast us. I love Vacation Bible School. 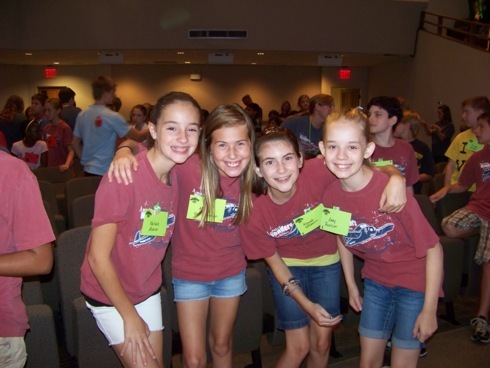 For the past thirty-five years in ministry, I have seen thousands of children attend VBS and hundreds of these trust Christ for their salvation. None of this would be possible, however, without the many volunteers who give of their time to teach classes, provide snacks, lead singing and craft projects, and do all of the things that make VBS fun and meaningful for children. For Kingsland and many other churches, Vacation Bible School is only weeks away. I encourage you to make the most of your summer by serving in some capacity in your church’s VBS. And while you’re at it, do what Mrs. Montgomery did and invite a neighbor to join you. Amen, brother. You never know who will come and who will be listening. True. That’s what makes it so exciting to play a role in reaching kids at VBS. I remember Angle Martinez, he preached a few revivals at Belmont Baptist Church in Odessa, I could not have been more that 7 or 8. He wore what was then thought to be loud sports jackets and played the trumpet. At that young age he may have been the first preacher that I really listened to. Good word, Bob. Yes, he often wore bright-colored sports coats and was very talented and engaging. Love this. I trusted Christ after listening to Angel preach a revival in 1979. After the sermon, all of us children went downstairs at the church to eat free hot dogs and ice cream. Thankful for this man and his legacy! Wow! Very cool to know that you are among the many who came to faith in Christ through Angel’s preaching. Great legacy. Blessings to you and the family as you head to your new assignment. HOMETOWN BOY MAKES GOOD! Wow! What a cool story, O! Praise God for Angel! This story touched me because I was born and raised in San Antonio, in the projects. My grandparents lived in San Antonio too, and were the strongest (and only) Christian influence in my life. They were strong, devout Baptists, who were at church every Sunday morning, evening and Wednesday evenings without fail. And when we spent the weekend at their house, my grandmother would drag us heathens to church! 🙂 I also have fond memories of attending VBS summers in San Antonio. And now, I am so very thankful for that! Thanks for sharing your story, Stephanie. What precious memories you are blessed with of godly grandparents.